Apple has released macOS Mojave 10.14.1 beta 4 for users enrolled in the Mac developer beta testing program. Usually a developer beta build is released first, and the equivalent as a public beta build arrives soon after. Beta 4 of 10.14.1 carries a build number of 18B67a. MacOS Mojave 10.14.1 beta apparently focuses on bug fixes and enhancements to MacOS Mojave, while also including support for several new features including over 70 new Emoji icons including a bagel and a parrot, and group FaceTime video chat with support for up to 32 participants. Users who are actively enrolled in the macOS Mojave beta testing program can find macOS Mojave 10.14.1 beta 4 available to download now from the Software Update preference panel in macOS. Recall that updating system software in macOS Mojave is now done through System Preferences rather than the Mac App Store Updates tab. 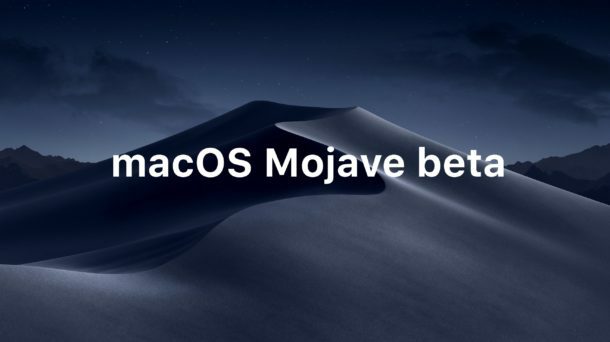 If you are running macOS Mojave and have opted out of Mojave beta updates you would need to re-enroll the Mac in the beta testing program to find the latest update available. Apple usually goes through several different beta builds before issuing a final release to the general public. Thus one could reasonably expect that a final public build of macOS Mojave 10.14.1 might be released sometime in the next month or two, likely alongside with the release of iOS 12.1 final and updates to watchOS and tvOS. Of course this is just speculation, as no one outside of Apple knows the timeframe for release of these system software updates. Separately, a few days prior Apple released iOS 12.1 beta 4 along with watchOS 5.1 beta 4 and tvOS 12.1 beta 4.